You can set new announcements to post at a certain date and time. The delayed post information also displays directly in the Announcements page. Delayed announcements are not displayed to students until the intended date and time. 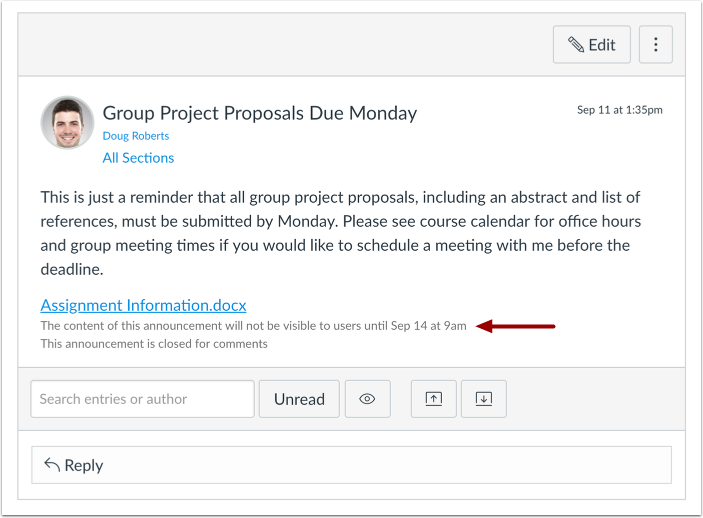 If you create an announcement in an unpublished course, the delay posting date must take place after the course has been published for notifications to send to those who have chosen to receive notifications for new announcements. If you check the Delay Posting checkbox and don't set a date the announcement will post immediately. Click the Add Announcement button. Click the Delay posting checkbox. Select the Calendar icon and set the date and time using the calendar tool. Or manually enter a date and time. View the delayed post information in the announcement. Previous Topic:How do I allow or disallow announcement replies in a course? Next Topic:How do I reply to an announcement as an instructor? 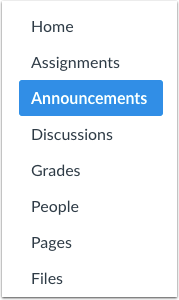 Table of Contents > Announcements > How do I delay posting an announcement until a specific date in a course? Re: How do I hide announcements copied from a previous course?